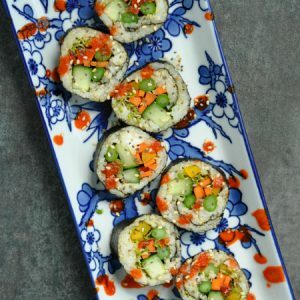 These Vegan Sushi Rolls with Quinoa Sticky Rice are a breeze to roll together and make a fun date-night dinner in the comfort of your own home! Make a few for a light lunch at home or an easy healthy dinner. Serving a crowd? feel free to double or triple the recipe as needed! You can even turn game night with friends and family into a DIY sushi roll party, letting everyone choose their dream sushi filling combo and toppings! Hello! It’s sushi! It rocked! 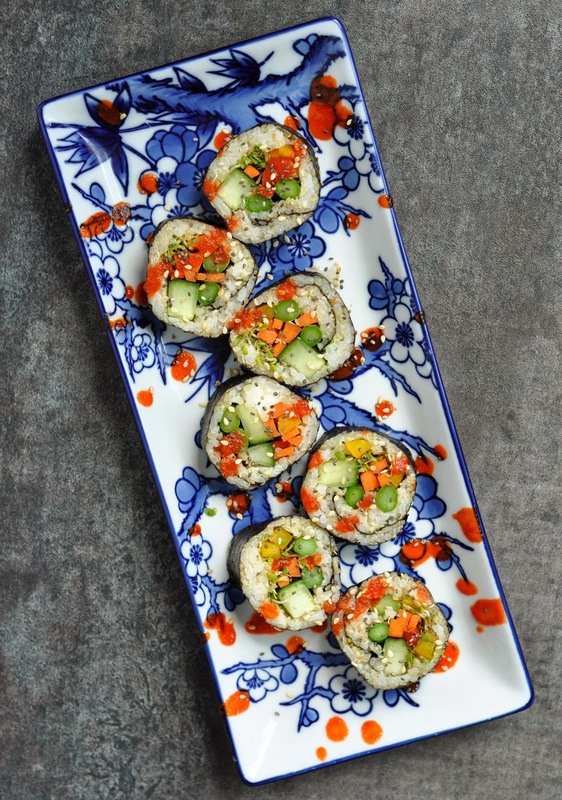 But seriously: I adored the addition of the quinoa to my usual sticky rice sushi rolls. It added a burst of whole grain goodness and a bit of nuttiness flavor wise; a perfect pairing for the crisp, refreshing vegetables. I was out of avocados (the baby eats them all! gah!) but added cream cheese to two of the rolls for a bit of creamy indulgence. They were fantastic! Heat a small pot to medium-high heat. Rinse your quinoa. drain it of all liquid, then add it to the pot, stirring constantly as you lightly toast it for extra nutty flavor. Add two cups of water as well as the rice and turn to highest heat setting. Once it starts to boil, reduce heat to low and simmer, covered, for twenty minutes. Once its hot and fluffy, season with vinegar, salt, and sugar. Fluff with a fork and allow to cool in a separate bowl. Cut the ends from the asparagus and blanch it briefly in boiling water to tenderize. 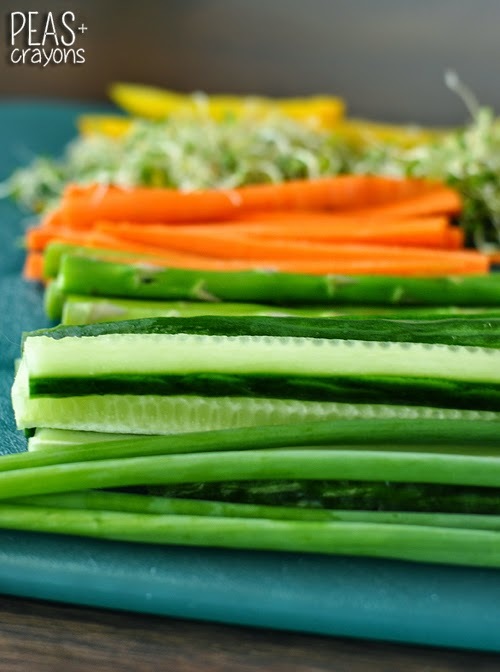 Next julienne the carrots, and cut the bell pepper and cucumber into thin strips. Snip as many strips of green onion as you'd like and grab a big fistful of sprouts too! I like to lay out all my veggies, toppings, and sauces, so that once the rice and quinoa are ready, I can quickly roll everything together and start chowing down. Cover a bamboo mat with plastic wrap and top with a sheet of nori. Using a large spoon, spread quinoa and rice in a thin layer atop the seaweed sheet. At the very end of the sheet, arrange your veggies in three compact rows. If you're adding fish or cream cheese you'll add it here as well. First time rolling sushi? [click here] for a photo tutorial of the entire process. Roll, slice, and sprinkle with sesame seeds! Serve with a side of low sodium or gluten-free soy sauce and top with a hearty drizzle of sriracha chili sauce. t-rex chefs sashimi-grade salmon and tuna can absolutely be added; yum! brontosaurus chefs feel free to add cream cheese or sliced avocado; adding a bit of fat to vegetables actually helps your body absorb their antioxidants! You’ll also want to pick up a bamboo mat to roll your sushi with. They’re extremely affordable and can be found in nearly any grocery store! They also have them on amazon, of course! CLICK HERE for my step-by-steph photo tutorial for homemade sushi. So what are you waiting for? Go make some sushi! These are the funnest little bites! The family loves them – love the vegan option! This looks amazing! 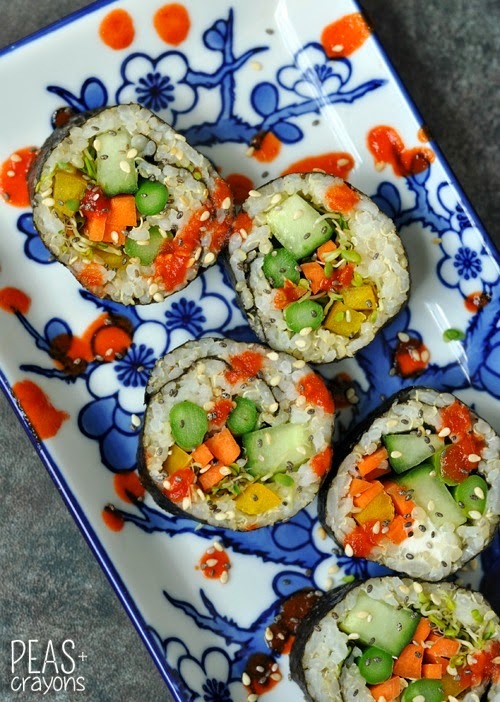 The next time I’m craving sushi, I’m staying in and making this! Yay! It’s such a healthy sushi roll and so flexible based on what veggies you have on hand too – hope you get a chance to try it soon! Hey Janette! Absolutely! I usually make enough to have it in the fridge for a few days. My husband adores it chilled and I like mine warmed up to room temperature. Since the noodles and veggies soak up the dressing, just make a little extra to drizzle on the salad when you take it out of the fridge and you’re good to go! Hope you adore it! Can you make more than 1 day ahead and keep in fridge???? Thanks, can’t wait to try this. can you just use Quinoa? or do you need the sticky rice to help hold it together? Love the peace sign pretzels and the idea of the pineapple pizza muffin. I’m on a major pineapple kick here lately! haha thanks! The dishes are from World Market! They have the BEST sushi stuff!!!!! Could you use sharp cheddar cheese cubes? That sushi looks amazing! And its Vegetarian friendly (at least i think all the ingredients are non-meat). I’m definitley going to have to take this recipe for a spin! Good golly these sure are a mouthful of yum! Glad your chickpea took a nap so you could share this recipe – my chickpea is 15 and it feels like just yesterday she was the same age as your chickpea, they grow up too fast! This recipe looks awesome and was secretly made for me 🙂 Yum! WHAT!?!!????!!???!!!!!!!?? I’m not reading this right!? Must. Be. Misprint. Whaaa!??? You make me want sushi, and I’ve never eaten it before. I know, I know; it’s like sacreligious. Forgive me Jenn, for I have sinned. shut up! How did I miss that?! I’m actually from MA so if I’m ever back visiting family I’ll holler at ya! it’s sooo pretty…. and all that sriracha makes me so happy. i stalked your fb profile like mad today. hahaha. you’re the cutest, i couldn’t stop looking at your pics!